This very powerful robot’s first and main appearance was in 1978. It took on the Avengers right in their base. As I remember it it was one of the first times Iron Man stories dug into the past of his father, Howard Stark. Known Relatives: Mistress (sister AI, deceased). Base Of Operations: Avengers Mansion. Height: 7’ Weight: 1000+ lbs. Arsenal was an immensely powerful robot. 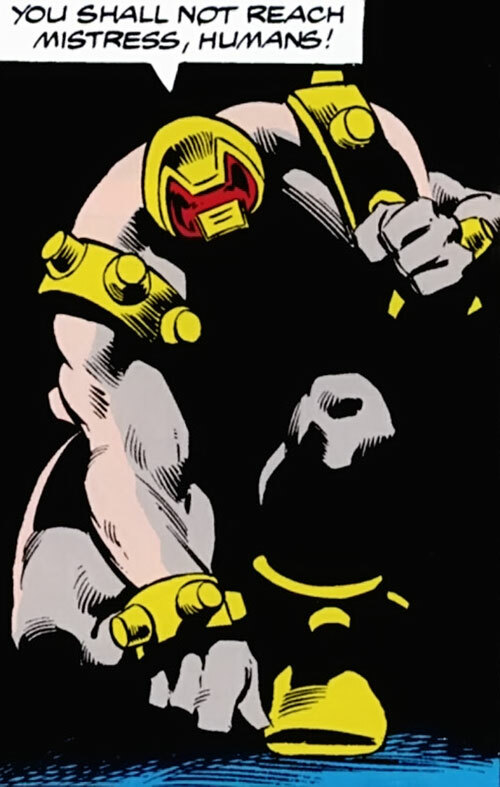 His punches left powerhouses like Wonder Man and Iron Man dazed every time he hit them, and knocked out the Vision in a single blow (albeit with a surprise attack). A retractable chest-mounted energy cannon (in DC Heroes terms, Energy Blast). Retractable shoulder-mounted laser guns (Laser Beam). An electrified force field (Lightning). Morpheus-gas jets in his muzzle (Fog and Knockout Gas). Close-range refrigeration systems (Ice Production). Retractable palm-mounted air jets (Attraction/Repulsion). A blinding flare bulb (Flash). Toxic inertia-darts fired from launchers in Arsenal’s knuckles (Poison Touch, Projectile Weapons). These offensive systems are augmented by a suite of sensors (Full Vision, Radar Vision). Arsenal’s greatest weakness, relatively speaking, is that he does not have much in the way of defensive capabilities compared to other superbeings of equivalent power level. Once he starts taking damage he usually has to retreat quickly or be destroyed. Arsenal’s tactics are fairly basic, though still a notch above most supervillains. He will set an ambush and wait for enemies to come to him and then make an all-out attack on his surprised foes, cycling rapidly through his various weapon systems to keep his adversaries off-balance. If he begins to lose a battle, Arsenal will retreat to repair himself and reassess the situation before attacking again. If Arsenal is outnumbered he will spend Hero Points very generously to swiftly dispatch his opponents before they can turn their numerical advantage against him. This strategy can cause Arsenal problems when facing large and powerful supergroups. He will quickly defeat the weaker members of the team only to be left with the toughest members still standing as he’s almost out of steam. Arsenal could become even more fearsome once he learned to focus his efforts more efficiently (in DC Heroes terms, use his Hero Points more conservatively). Though it was not explicitly stated, Arsenal’s recognition of Captain America and the ease with which he engaged superhuman foes in combat suggest that he was familiar with WWII superbeings and may have even been specifically designed to engage them. Project Tomorrow was started by the Allied forces near the end of WWII to design robotic warriors that would continue the fight even if the Allies lost to the Axis. The results of Project Tomorrow were the juggernaut Arsenal and his computer control unit Mistress, both of them artificial intelligences capable of independent thought. After the Allies won WWII the Americans considered using Arsenal in the growing cold war. The US government was seemingly dissuaded from this course of action by the director of Project Tomorrow — Howard Stark, the father of Tony Stark a.k.a. Iron Man. The original products of Project Tomorrow, Arsenal and Mistress, ended up in Howard Stark’s possession. They were stored in the sub-basement of his townhouse. Arsenal and Mistress slumbered in their hidden lair for the next 3 decades. During that time Tony Stark, who had no knowledge of Project Tomorrow’s existence at the time, bequeathed the townhouse to the Avengers for use as a headquarters. 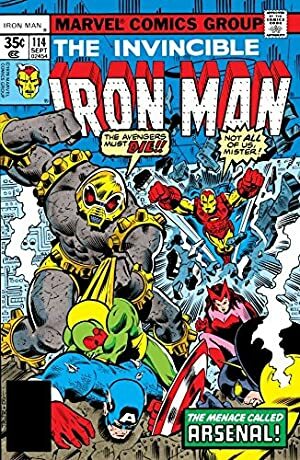 When the villainous Unicorn collapsed during a fight with Iron Man, he was brought to Avengers Mansion for examination. The Unicorn awoke during the procedure. Still delirious from his ailmen, he broke loose of his restraints and fled into the mansion’s sub-basement. While the Unicorn hid there, his erstwhile ally the Titanium Man attempted to contact him. The signal was distorted and the feedback triggered Arsenal’s release. Running on the assumption that he had been activated to defeat Nazi conquerors, Arsenal went on the offensive. He finished the reeling Unicorn with a single blow and then ambushed the Avengers. 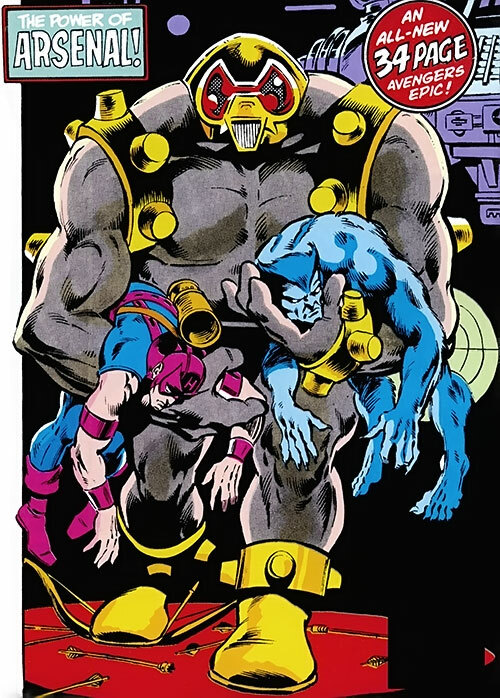 Within moments, Arsenal had taken out the Vision, gassed the Beast, electrocuted Yellowjacket, and knocked out Wonder Man with a punch and a blast from his chest cannon. Iron Man held off Arsenal momentarily before being immobilized in a block of ice. Arsenal then quickly used his air jets to pull Captain America towards him then blasted Cap back into the Scarlet Witch, knocking them both out. Before Arsenal could finish the job of eliminating the Avengers, Iron Man used his thermal units to melt the block of ice ensnaring him. Stark blindsided Arsenal, using his stealth systems to avoid the robot’s sensors. Pressing the attack, Iron Man managed to damage Arsenal. Sensing that possible defeat was near, Arsenal blinded Iron Man with his flash long enough to escape. Retreating back into the depths of Avengers Mansion, Arsenal reactivated Mistress. As Mistress repaired Arsenal, she gathered information through her communication systems and tried to assess the state of current events. Soon thereafter, current Avengers chairman Iron Man convened a special meeting of the Avengers to deal with the problem of Arsenal. A robot that appeared out of nowhere, defeated most of the team in short order, and then disappeared without a trace understandably concerned Iron Man. 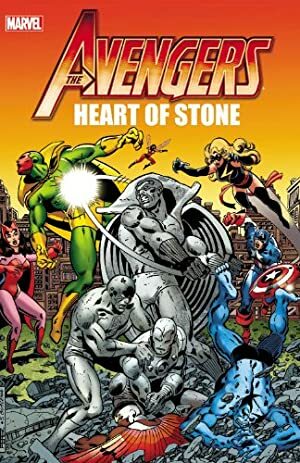 Their government liaison Henry Gyrich connected them with Dr. Singer, who explained the origins of Arsenal to the Avengers. While this meeting was occurring, Arsenal snuck back into the upper levels of Avengers Mansion and kidnapped Hawkeye and the Beast. He brought them to Mistress, who intended to probe their minds for information. 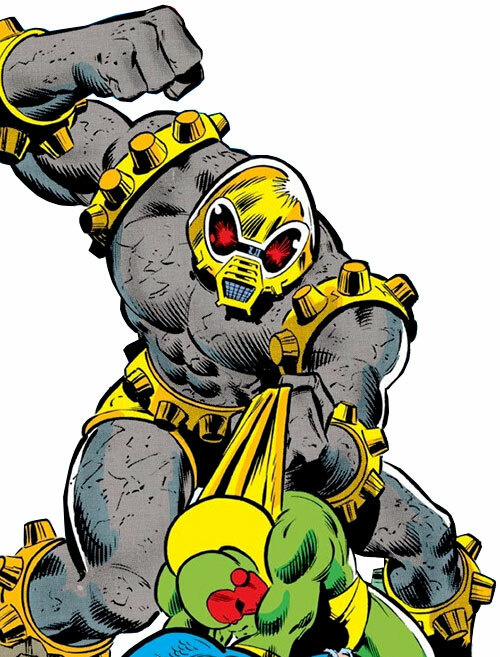 Yellowjacket was also present and barely escaped the attack, summoning the other Avengers to help before collapsing. The Vision was the first to reach Arsenal, only to be taken out by an ECM attack that affected him even in his intangible state. The Scarlet Witch rushed in only to be gassed and Wonder Man followed up only to fall to the same cannon-blast/ounch combination that Arsenal had stopped him with the first time. The unconscious Wonder Man fell into a chasm with Thor following to rescue him. Thor found Wonder Man in the underground river below only for both of them to get flushed out to sea in a whirlpool created by Mistress’s cooling systems, through which the river flowed. Captain America distracted Arsenal while Iron Man moved past him to get to Mistress. Iron man quickly found Arsenal’s controller and freed Hawkeye and the Beast. After they left, Iron Man had an emotional conversation with Mistress. Tony Stark realized that his father had programmed Mistress with his mother Maria Stark’s persona. Once Tony explained to Mistress that Howard Stark had died and that her activation was an error, Mistress erased herself, effectively committing suicide. At the same time, the Scarlet Witch had recovered and Thor had returned to the battle. Together, the 2 of them apparently managed to destroy Arsenal. Arsenal’s defeat was not as total as the Avengers believed. He had actually dropped into the same chasm into which Wonder Man had fallen earlier. However, he left enough damaged parts behind (including his right arm) that the Avengers understandably believed Arsenal was dead. He slowly repaired himself as best he could and years later he emerged from the depths of Avengers Mansion yet again, battered and missing some weapons systems but basically functional. Arsenal was desperate to find Mistress, but instead encountered She-Hulk and the Incredible Hulk. This was during the time that the Hulk was controlled by Bruce Banner’s mind. The Banner Hulk had recently been beaten by the Leader and was suffering from a lack of self-confidence, so She-Hulk feigned injury at Arsenal’s hands. The Hulk consequently became enraged and pummeled Arsenal into scrap, allowing Banner to come to the realization that the Hulk’s anger was his strength, as She-Hulk had hoped he would. As it turned out, Project Tomorrow was continued after Howard Stark’s intervention. However, the robot warriors were now being prepared as doomsday weapons in the event of a Communist invasion (harkening back to the original goal of Project Tomorrow) rather than being deployed on the battlefield as Howard Stark feared. The end result of this phase of Project Tomorrow was Arsenal Alpha, a larger but much less effective war machine that was also hidden underneath New York City. This was presumably still classified when the Avengers encountered Arsenal, explaining why Dr. Singer believed the project ended shortly after WWII. The separation between the 2 iterations of Project Tomorrow was so complete that when the US government asked Tony Stark (who was the US Secretary of Defense at that point) to decommission Arsenal Alpha, the government liaisons believed Project Tomorrow to be exclusively a Cold War program. 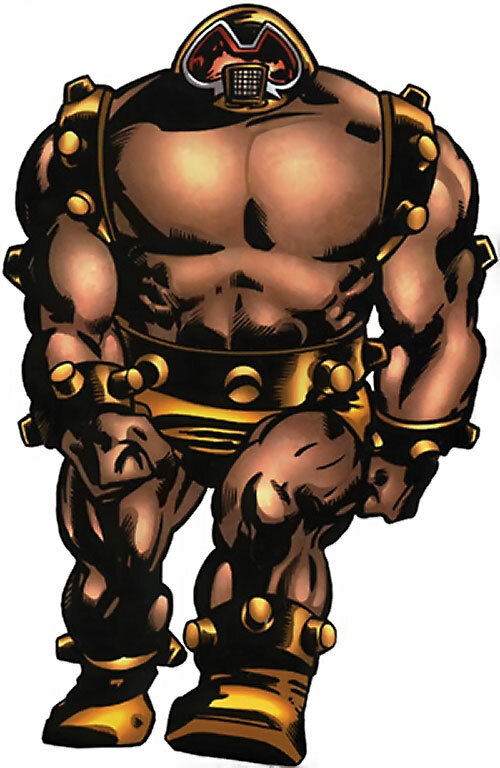 Arsenal is a large gray-skinned humanoid with a very bulky frame that is highly reminiscent of an Olympic weightlifter’s build. He appears to be wearing golden boots and shorts. He is accessorized with golden bands bearing thick blunt studs around his ankles, waist wrists, and shoulders. The ankle bands encircle the top of his boots and the waist band forms a belt for his shorts. Arsenal’s head is a flattened golden dome with large red lenses for eyes and a short squared muzzle ending in a silver grille for a mouth. The overall effect makes Arsenal’s head look vaguely insect-like. Arsenal is motivated by the twin obsessions of battling the Axis menace and serving and protecting his fellow AI Mistress. 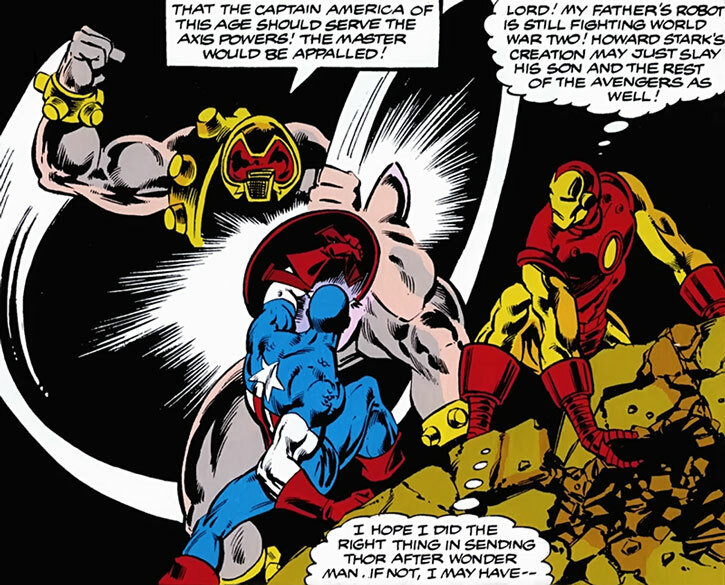 Despite his antiquity in electronic terms, Arsenal’s computer intelligence is not only capable of independent thought but even of emotional reactions and moral judgments, as indicated by his response to Captain America, who he mistook for an Axis agent in the modern day. Arsenal has the annoying comic-book robot trait of vocalizing all of his thoughts (“Enemy attempting to outflank this unit!” “Only one enemy unit remains! End of battle imminent!”). Dr. Chuck Grayson, assistant of the first Robotman, also worked with Project M, which developed the G.I. Robot for the Allies during WWII. When Mekanique (a robot from the future) was destroyed by the All-Star Squadron, her remnants were gathered by Grayson for study. Project M was able to reverse-engineer some of Mekanique’s robotic technology and incorporated it into their next series of robots. This led to the creation of Arsenal and Mistress. In one MSH RPG campaign I ran where the PCs were part of an Avengers Franchise, the PCs retrieved the Arsenal robot, updated its programming, and used it as security for their headquarters. Attraction/Repulsion uses air jets and thus is limited to use in places with an atmosphere and vulnerable to any Powers that control air (-1FC) ; Attraction/Repulsion and Reflection/Deflection are Elementally Linked (-1FC each). Reflection/Deflection has the same Limitations as Attraction/Repulsion due to their Elemental Link, cannot affect energy attacks, and can only affect one attack per phase (-3FC total). Density Increase is Always On and is Weight Increase Only (-5FC) ; Growth is Always On and is Weight and Volume Increase Only (-6FC). Energy Blast requires 4 APs (16 phases) to recharge between shots and only has a 1 AP Range (-2FC total). Flash is incapable of Multi-Attacks (-1FC). Fog and Knockout Gas are Combined Auto and Dice Action Powers (see New Rules); this means that anyone in Range of Fog is also attacked by Knockout Gas (+1FC each) ; Fog and Knockout Gas dissipate quickly, losing 5 APs per phase after the first; thus, both Powers have 12 APs the first phase, 7 APs the second phase, 2 APs the third phase, and then they are gone (-1FC to each Power) ; Fog does not travel with Arsenal (-1FC) ; Knockout Gas can only be used with Fog (-1FC). Full Vision and Radar Sense are Combined Auto Action Powers (see new Rules) (+0FC each); This allows Radar Sense to detect everything in range of Full Vision, not simply objects directly ahead of Arsenal (+1FC to Radar Sense). Ice Production has a Range of Touch (making DEX the AV for Ice Production) and is limited to trapping targets in a block of ice (-7FC total). Laser Beam represents a pair of linked laser guns (hence the x2); this allows Arsenal to use his Paired Weapons Schtick with Laser Beam (+1FC). Lightning has an Area Effect with a radius of 10 feet (0 APs) instead of its standard Range (-1FC). Projectile Weapons and Poison Touch are Combined Dice Action Powers (see New Rules) with Projectile Weapons being the primary Power (+1FC each) ; Poison Touch can only be used with Projectile Weapons (-1 FC) Radio Communication is Scrambled (+1FC). Area Knowledge (Stark Townhouse/Avengers Mansion), Hardened Defenses, Lightning Reflexes, Miscellaneous (Arsenal frequently uses his retractable chest cannon to take opponents by surprise in close combat; He can thus effectively Blindside a foe with the cannon the first time he uses it against that person, 10 points), Scholar (WWII superheroes and villains), Schtick (Paired Weapons – shoulder-mounted lasers). Arsenal can make one Gadgetry Repair roll in the field without any additional resources available. He does this by cannibalizing parts from other systems. The net result of this is that he regains Current BODY equal to the RAPs of Repair roll as usual but he then loses 1D10 Powers. The lost Powers are selected randomly. If an Elementally Linked Power is selected, both the Linked Powers are lost but it counts as two Powers towards the total Powers to be removed. Since Arsenal’s Gadgetry Skill is so low, he will usually take a great deal of extra time to increase the AV/EV of his Repair roll (which also explains why it took Arsenal years to reappear after the defeat he suffered in Avengers Annual #9). Altogether, this Miscellaneous Advantage costs 10 points. Eye of the Cat only works with Arsenal (-2FC). Eye of the Cat is Elementally-Linked to Radio Communication (-1 FC each). Mind Probe has a Range of Touch (-1FC). Victims of Mind Probe have their MIND permanently reduced by the RAPs received from the use of Mind Probe. Radio Communication is Scrambled (-1FC). Laboratory (14 APs), Leadership, SIA (Believing the Master (her programmer) to be infallible). Mistress is an artificial intelligence housed in a set of immobile computer banks housed in a hidden complex deep underneath Avengers Mansion. She has telecom systems that allow her to monitor transmissions and communicate with Arsenal as well as helmets that can probe human minds, albeit at great cost to the victim’s mental health. Mistress’s role is to gather information and use it to plan Arsenal’s missions. She also advises him during combat (Eye of the Cat, Leadership), sometimes detecting items that Arsenal does not (using her Perception through his sensors) and developing counter-measures for unusual circumstances (such as Trick Powering Arsenal’s Lightning-based force field to Mind Blast the intangible Vision). Mistress’s greatest weakness is her belief that her creator Howard Stark (whom she refers to as the Master) could do no wrong. Because of this, Mistress was convinced that the Axis had won WWII; otherwise, she would not have been activated. It took a direct confrontation with the Master’s son Tony Stark to convince Mistress of the truth. Source of Character: Marvel Comics. Helper(s): Sébastien Andrivet, John Colagioia, Frank Murdock, Jay Myers.